A common problem among toilet bowls is the flush valve. The flush valve controls the flushing lever and the level of water within the toilet bowl. You may notice the valve does not flush properly, causing the water to run or the bowl to never fill up properly. To fix this, you will need to adjust the flush valve, which is commonly called the flapper valve. To ensure your toilet flushes properly, adjust this valve when needed. Ensure your toilet flushes properly by adjusting the flushing valve when needed. Place a towel on the floor next to the toilet. Remove the toilet tank cover and place it on the towel. Shut off the water supply to the toilet by turning the shut-off valve to the "off" position. 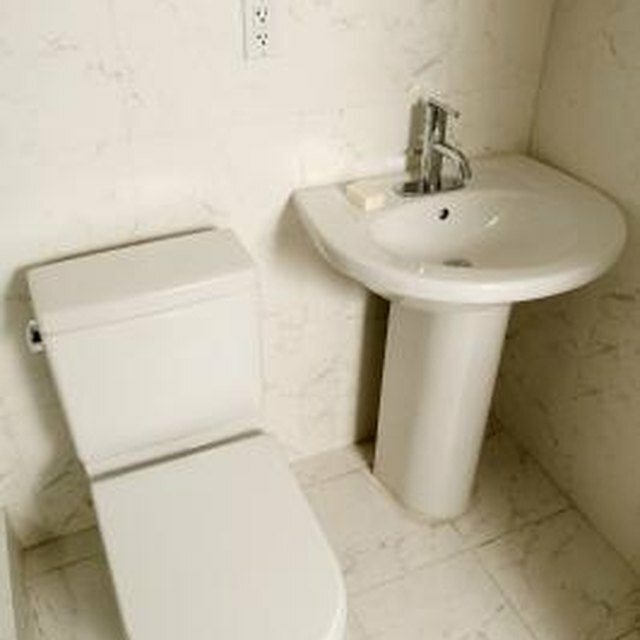 The shut-off valve is located behind the toilet bowl and is a small lever that can be turned left and right. Flush the toilet to drain the tank of remaining water. This will remove the water from the tank, making adjusting the flush valve easier. Locate the floating device that sits on the surface of the water. This device is attached to a chain, which is connected to the flush valve. Follow the chain to the flapper ball. The flapper ball looks like a small balloon. The chain is connected to the ball using a small clip. Unclip the chain connected to the flapper ball. Adjust the chain length. To make the chain shorter, fold the chain over a few links. To make the chain longer, unfold a few of the links that lag behind the clip. A shorter chain will make the flush valve flush with a small push; a longer chain will result in having to hold down the flush valve a bit longer to flush the entire bowl. The longer the chain, the more water the tank will hold before the toilet stops running. Replace the clip on the chain so the chain is reconnected to the flapper ball. Replace the lid on the top of the toilet tank and turn the water back on.